CTM Development announces FoxTrot Professional Search 2.5, an update to their popular document indexing and retrieval solution for Mac OS X. Developed with a focus on law firms, media and mobile professionals, FoxTrot Professional Search helps locate documents and their contents using multiple categorization of search results, ranked by relevance. Utilizing the latest Cocoa / Snow Leopard technologies, the application works directly with PDF, HTML, word processing, e-mail and rich-media metadata. Geneva, Switzerland - October 28th, 2009 – CTM Development today is proud to announce FoxTrot Professional Search 2.5, an update to their popular document indexing and retrieval solution for Mac OS X. Perfect for anyone who works with saved documents for future reference, FoxTrot Professional Search helps locate documents and their contents using multiple categorization of search results, ranked by relevance. FoxTrot Professional Search is a powerful find-by-content solution that offers precision tools for finding the proverbial "needle in a haystack" directly within PDF, HTML, word processing, e-mail and rich-media content and metadata. The product has been especially well received in legal (law firm and courts), media (newsrooms researchers, ad agencies and editors), mobile contexts (MacBook users with document collections) as well as by casual users stepping up from FoxTrot Personal Search or Apple's Spotlight. 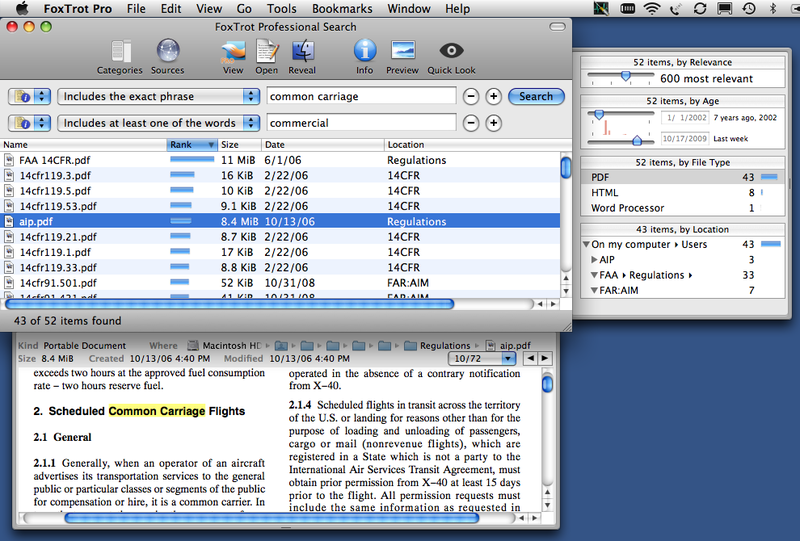 By leveraging and extending Mac OS X's built-in Spotlight capabilities, FoxTrot Professional Search utilizes the latest Snow Leopard technologies, featuring document preview and full view capabilities, with secondary document-level search features. Users can manage multiple indexed collections effortlessly and time search index updates without even launching the application. "CTM Development has been creating search and collaboration software since the first multi-platform Swiss telephone directories back in 1987, and search has been an important part of CTM PowerMail since its inception in 1995," said Jean-Michel Karr, co-founder of CTM Development SA. "FoxTrot Professional is the culmination of many years of focus on find-by-content." When customers purchase a 5-user license, the application automatically acts as a peer-to-peer indexing server. With a 10-user license (or more), customers receive a full fledged client-server product with a server component that can be deployed any Mac OS X or Windows 7/Vista/XP with file sharing enabled, as well as on XServe and the new Mac mini Server or Windows Server 2003, Windows Server 2008 and Windows Server 2008R2. This makes FoxTrot Professional Search particularly suited in networked environments where sharing archived documents and metadata is paramount. FoxTrot Professional Search 2.5 and FoxTrot Search server are available immediately. A single user license is priced at only 99 Euro. A 5 user license (includes peer-to-peer sharing) is available for only 199 Euro. A 10 user license also includes FoxTrot Search server for 390 Euro, with degressive per-seat enterprise licenses available. FoxTrot Professional Search 2.5 is available as a full-featured 30-day demo. FoxTrot Search server is available as a full-featured 90-day demo. FoxTrot Professional Search 2.5 is a free update for current FoxTrot Professional Search licensed owners, and is available to current FoxTrot Personal Search users for the difference in price only (69.3 Euro) via a coupon e-mailed to all registered owners. Headquartered in Geneva, Switzerland, CTM Development SA is a privately held company co-founded in 1985 by longtime software developer Jean-Michel Karr. With a rich history dating back to the Apple II and 512k Macintosh, CTM Development is committed to providing the highest quality software and founded for the purpose of developing unique productivity solutions for the Mac platform and enterprise, with a major emphasis on total customer satisfaction. In 2003, the FoxTrot core search engine was designed and developed from scratch by Jerome Seydoux, an experienced NeXTStep and Mac developer, for use within PowerMail and new find-by-content solutions. FoxTrot core is a key component of PowerMail 6 and is at the heart of the standalone line of FoxTrot Search products. Copyright 1985-2009 CTM Development SA. All Rights Reserved. Apple, the Apple logo, Cocoa and Spotlight are registered trademarks of Apple Computer in the U.S. and/or other countries.